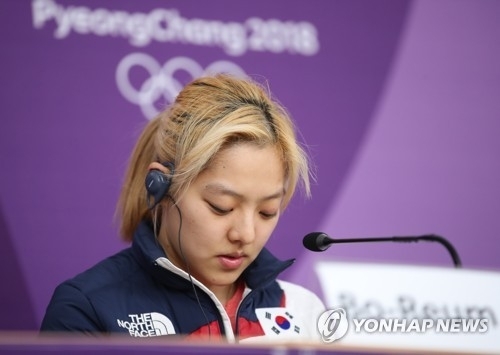 SEOUL, March 14 (Yonhap) -- South Korean speed skater Kim Bo-reum, who won silver in the women's mass start at the PyeongChang Winter Olympics, has been hospitalized for psychological treatment, along with her mother, the athlete's agency said Wednesday. Bravo and New said Kim visited a hospital in her hometown of Daegu on Monday, and a doctor advised hospitalization after she showed symptoms of anxiety disorder. Kim's mother showed similar symptoms and was recommended for hospitalization, it added. Kim was at the center of controversy regarding South Korea's performance in the women's team pursuit competition. She was bombarded with censure by the public for blaming her teammate Noh Sun-young for the team's poor performance in a preliminary contest. According to officials, Kim was afraid to meet people during her stay at the athletes' village in PyeongChang, Gangwon Province, following the incident. The 25-year-later claimed silver in the women's mass start, but that failed to quell fans' anger. "It looks like her trauma from the Olympic Games was severe," an official with Bravo and New said. "Since we haven't seen the results of other mental tests on her, it isn't clear how long she will stay at a hospital with her mother."